For the centenary of the 1916 Rising Dublin City Council and University College Dublin has partnered to organise a free public conference. 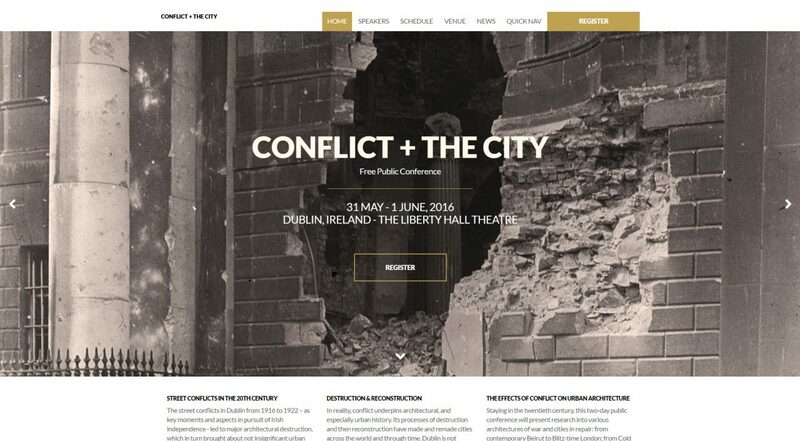 Staying in the twentieth century, this two-day public conference presented research into various architectures of war and cities in repair: from contemporary Beirut to Blitz-time London; from Cold War bunkers to Belfast’s peace-lines. The two days of papers will highlighted issues of renewal, rupture, defence, bias, heroism, vision – throwing light on the complex effects of conflict upon urban architecture. The conference took place on 31st May and 1st June 2016 in Liberty Hall Theatre Dublin 1. It was organised under the auspices of the Dublin City Heritage Plan and UCD Decade of Centenaries by Irish Research Council post-doctoral fellow, Dr Ellen Rowley, and was supported by the Heritage Council County Heritage Plan Grant Scheme. Neo-Archaic was asked to create a temporary website to display the conference schedule, speakers, and papers. A responsive Wordpress template was chosen and customised to facilitate mobile booking and getting the latest info on the go. An embedded Eventbrite booking form allowed registration directly from the website.